As if I didn't need another reason to feel old older, I heard on the radio the other day that Michael Stipe has turned 50 years old. That just doesn't sound right - seems like only yesterday my high school and college friends were buying REM CDs. While I'm not a huge fan of the group, the milestone birthday seems like a good enough reason to pick them for today's Two Forgotten Favorites. One of them you actually may not have heard before - it's a remake of a 1971 Tommy James hit (after he left the Shondells) called Dragging the Line. 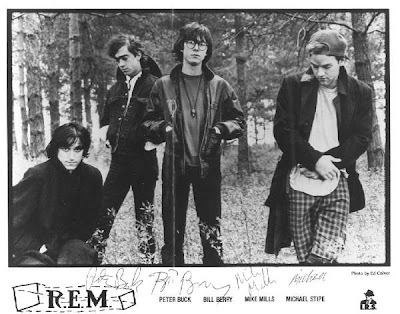 REM's version appears on the soundtrack for Austin Powers 2: The Spy Who Shagged Me. My other choice is 1989's Stand - one of my favorite REM songs. I'm off to the Cape later today and won't be online, so I hope you all have a great weekend. Stay tuned for August's Retro Hottie of the Month, which may be a day or two late being posted! I do like a few of their songs. I had their greatest hits but sold it at a flea market in the mid 90s. I hadn't remembered that song being in Austin Powers 2. Stand is a good one. I hope that you enjoy the Cape. I am looking forward to seeing your next retro hottie. It's the end of the world and I feel fine! "Draggin the Line" was -the- great rollerskating song. The REM version is excellent! My favorites are "The One I Love" and "Shiny Happy People" video w/ Kate Pierson of the B-52s (I love her look today; more beehives!). I bought the Austin Powers soundtrack b/c of "Dragging The Line". Pam, the more I read about you, the more I love you and I think we were seperated at birth at one point, lol. Always love reading your stuff!! Michael Stipe is 50?!?!? Ohmygod. I had no idea he was that old! I was already having difficulty coming to terms with the 90s now being considered vintage, but this just blows me away.